Whew! Here we are at November 30th. I may or may not make it through to NaBloPoMo. I have three days to put content into and if I do that by the end of the night, great. If not, well, that is great, too. To tell the truth, considering that I am operating under less than optimal conditions for blogging and posting and reading blogs or any of that, I am thrilled that I got this far and am only three days down. Technically I could just.......wait. I think I have an idea forming in this tiny little skull of mine. We'll see if it works out. Did she or didn't she knit 50,000 stitches in the month of November? Well my friends, there were many stitches knitted, many stitches unknitted and frogged and ripped out. Unfortunately the number of stitches pulled out do not count to the final total. Interestingly, I have never kept track of how many stitches that were in any knitted object and frankly the numbers stunned me. I did complete two sweaters, the second one is blocking right now. The first sweater totalled 52,349 sts. Give or take. By totalled I mean there are that many stitches in the finished item, but in the entire process of knitting that sweater there were 59,203. Yep, more than 6,000 stitches were unknitted and reknitted in the process. Here is the real shocker: I usually rip and reknit a much greater percentage of a garment when I am knitting it. Just my M.O. I try to explain this to my students everytime I encourage them to rip something out to fix an error or just to make something better and they believe that a sign of a good knitter is not having to rip out. OH! how they complain they are just NEVER going to be a good knitter! I rip out way more than I even encourage them to and now I have the numbers to prove it! The second sweater was a whopping 26,806 stitches. Not as many, but the yarn gave it challenges of its own. So, I am giving thanks at the end of the month of Thankgiving that my hands held out, my sanity remained just as shaky as ever and I have two new sweaters to wear. Actually, three. I am still needing to put buttons on this one, but I have worn it already, I love the way it drapes when it is open. My fingers are twitching to cast on right.now! Oh, what will be the next knit? So, if you made it through the merry-go-round of links and make-up posts you may have noticed that I need just.one.more.post. At the point of every project whenI knit like a mad woman to get it finished start obsessing and planning for the next project and spend way too much on ravelry and combing through my stash and living in indecision and never ending options. In short, I am neither knitting or deciding. I'm obsessing over how to turn my worsted/aran weight yarn into this bulky weight sweater. Oh, and there is more to obsess on with this one. First, swatching in the round. UGH! Second, to pullover or to cardiganize. Maybe I'll go knit a few rounds, check raverly, no. Knit a few rounds. 2012. Thirty-five. Does anyone hate knitting sleeves in the round from the top down as much as I do. No wonder I prefer planning my next project. This is an oldie, but a goodie. I don't have a lot to write about it actually. Mostly because it is a knit that I finished over two years ago, but haven't marked it finished on raverly yet, so I don't remember much more than I had a button that I wanted and drove far and searched wide before I found it, but find it I did. I'm contemplating how much I love it. And how much better my hair will look in 2012. And those jeans! UGH! 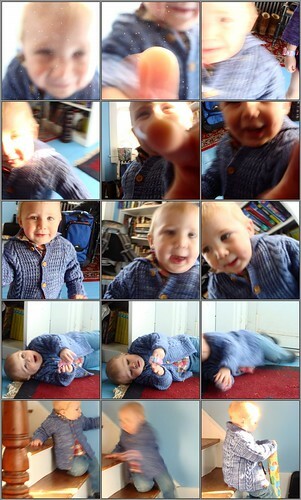 This reminds me about the button ordeal. I posted about it here and then when I found them a few months later, here. That was back when Erin and I watched Project Runway together and shopping at Mood is a huge part of that show. She was on a tour of Europe at the time, but when I got there I texted her that I was AT MOOD! you know, thinking she would be a little bit excited about it. She's so cute. She texted me right back: Great! I'm in SWITZERLAND!!! Brat. She wasn't my favorite that day, Gillian took over for the week. It's a transitory honor in my heart. 2012. My final, out of order post for NaBloPoMo. I DID IT FOR REAL! I wish I had a photo that captured the great color. I have knitted a lot of garments in superwash wool lately and the difference between that and this........... HUGE! It is well known around these parts that I am NOT A FAN of superwash yarns. I hate them. They go into the water and you pull out a lump of overcooked, limp noodles. I had grown so used to it that when I soaked the pieces of this sweater to block and they felt like nice, sturdy, squooshy, solid wool that was holding its shape even while blooming out I was surprised. OH! I remember that feel. That is the reason I love blocking and finishing. Well one of them anyway. This yarn was easy to knit, slid through my fingers and created perfect definition in the fabric. As usual Anne did a great job with the pattern. I have knitted something like four or five of her creations and have never been disappointed. My only changes are usually due to my row gauge being different and I am in the habit of rewriting shoulder cap instructions to suit my specs. This is entirely suitable to an adventurous beginner who can follow what turns out to be an easily memorizable stitch pattern. This photo comes only a teensy bit closer to the true color, but does show the crispness of the fabric. For me this was the perfect balance of pattern simplicity and complexity. There are times when I am happy to be married to a chart and working complex stitch patterns, and other when stockinette stitch is just what the doctor ordered. This stitch pattern fell right in between, as I said, easy to remember and enough action to keep my attention. UGH! I wish I had better photos. I'll get modeled shots when I finally find buttons, someone requested a pool shot after all. So, this sweater got me comfortably into the required stitch count for NaKniSweMo. 52,349 stitches reside in the finished sweater. 6,854 sts were ripped and reknitted. For a peak into my usual process in a sweater, and maybe a chuckle, click over to my ravelry project page for the break down. 2012. That's not all! I didn't give up on the 20th! I knitted and entire 'nother sweater before the month ended! Check it out. Never knowing when the dreaded # sign is going to take over the machine I'm going to make it quick! My weekend included lots of yarn, different yarns, different projects. I just love when, like puzzle pieces, the individual parts start coming together and the picture begins to emerge. Weekending along with Amanda of The Habit of Being. 2012.Twenty-nine. 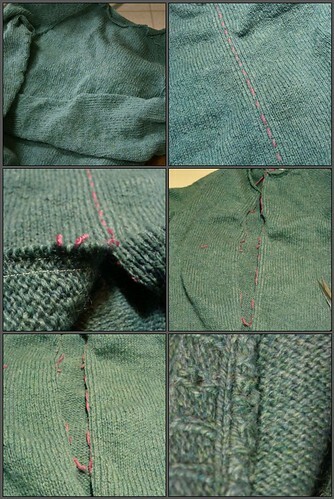 And yes, I am perfectly fine with macro-photos of my seaming! Can I finish a second sweater for NaKniSweMo? I don't think this has been entertaining enough. Where has the crazy been? Wool. It does a body good. I'm not sure I'll be able to complete NaBloPoMo. My laptop continues to decline and the funds are not available at the moment to replace it. I know there are less expensive ways to get back up and running, but I really want to stick with a Mac. My photo editor is not working anymore, I tried to adjust the color of the photo above online, but that was frustrating and I'm only kinda not close at all. Or maybe I'm closer than I think, hard to tell. I'll keep posting for as long as I can, though! And then I'll put up a few from my phone, because that is fun! fun! fun! I might actually finish that sweater for a successful NaKniSweMo. It might not reach the 50,000 stitch minimum, but to be honest I don't really give a sh....., ooops, care. Heh. I just wanted a new sweater. I have that other sweater that still needs buttons, I hope to have that ready to wear this weekend as well. There may be another one on the way, too! 2012. Twenty-five. Well, there it is. Knitting in progress. Beautiful, crisp stitches crafted in wool. I could look at that all day long. I don't always consider myself a fully realized, mature adult. I mean, in some ways I am so there, life has done whatever it does to grow me up in some ways, like it or not. On the other hand, the universe often sends me messages to which something in my personality responds while stomping my feet, "You can't tell me what to do! You're NOT the BOSS of me!" like a stubborn toddler. There is the time I climbed Mt. Washington. The time I hemorrhaged for days because I was too busy to slow down. Almost dying has a way of slowing you down. There was that time that I saw the cutest little sweatshirt at a craft fair, it had a heart shaped doily on it with ribbon roses and ribbon bows and I wanted it so bad for my girls, but the price? Out of my range. This was pre-internet and something I thought I would be able to buy at a local craft store was not to be found. Anywhere. I get a little tenacious in the face of these setbacks and I managed, by searching the ads in the back of magazines and making a lot of phone calls over days, to find them and make my vision a reality. I will drive anywhere, spend what I need to (okay, within some reason), pressure family, endure pain, start, stop, restart..... I don't stop. My husband no longer questions trips far and wide or my tunnel vision when it comes to something I've decided I am doing or need to have. That brings me to NaKniSweMo. I really want this sweater. I mean, WAAAANNNNNTTTT! that sweater! I envision it as being the perfect 'grab on the way out the door' sweater that I'll throw on over everything. I've already written its story in my head. I'm not even kidding, in my daydreams this sweater was knitted with this yarn (a little heavy, but exactly what I was going for), washed and blocked into a slightly fulled and soft fabric, adorned with the perfect button, worn on every errand, apple picking, visiting the vendors at the sheep and wool festivals, snow-shoeing, apres-ski, spinning around on a snow dotted mountain peak, it's spring in Austria and the grass is coming up and the birds, the sweater and I are breaking out in song......... always maintaining a casual, cozy chic that only the best sweaters can manage, all the while being my constant cold weather companion and over the years becoming slightly pilled and worn, earning elbow patches and when it finally gives up the ghost would be much mourned. Except that it would never die because I envisioned this sweater in Peace Fleece from my stash, which would never wear out. In my dream, sentimentality would have my daughters fighting over it after I am gone (and of course only one of them has short enough arms and would totally win it). So I swatched the Peace Fleece. This is where my vision started losing its dreamy glow. Knitting this yarn is not easy for my hands. There wasn't a smooth motion of needle sliding in and stitch sliding off, it was a struggle. I inserted mental earplugs to the niggling little voice telling me that this might not be a good idea, ignored the pain brought on by the hard work and kept knitting away. The pre-washed swatch was stiff, but I have experience with Peace Fleece and know what a good bath does to the fabric. And it did. OH! My dream was starting to brighten again! Meanwhile, I decided to swatch for another sweater with another yarn. I have really wanted this sweater and while my daydreams for it aren't as full blown and technicolor-ed in my mind, it is one that will fit nicely into my life. With the first row everything was easier. The action of knitting was smooth and comfortable. I was far off of the gauge, but it blocked out to nearly the gauge and a beautiful fabric. I spent nearly two hours to get that much knitting done, playing my vision and dream over and over as all of my joints from the shoulders down started to hurt and the going was s-l-o-w. I kept seeing myself in this sweater, knowing it would be worth all of the knitting time, planning that I would knit both sweaters at the same time so I could give myself a break from the hard knitting and since it was a lot of stockinette stitch, it would get easier, right? The love I would have for it would outweigh any issues in the creation, right? The ribbing, it was hard. I started to feel tingling in my fingers and was stopping to massage my forearms often. And with every difficult stitch I started to think wisely. I started to mentally shop my stash for another yarn that might be appropriate. I started to mentally shop yarn stores for even more yarns. Throughout it all the brightness of the recurring dream was dimming and with regret I set the knitting aside. I haven't removed the needles and pulled it out yet. That will be the final sign of maturity and I haven't quite gotten there. Yet. In my mind I am still the opposite of gotten there. 2012. Oh, COME ON! You totally write musical romantic comedies for your knitted items! I'm not the only one, that is for sure! Most people who have attempted to keep up a blog would have to cop to the fact that coming up with something to write, especially something to put on the blog every day, can sometimes be the toughest thing. Repeated weekly themes help give structure and focus to the thinking process and in the past I have participated in a few. Weekending, which Amanda of Habit of Being started, is the perfect way to start off the week and to keep you looking for blog-able moments during the weekend. Well, I wasn't that good at that, but I can share a little about my weekend with some photos. I blocked a sweater this weekend, and as the actual knitting was coming to an end I started the search for buttons. Many buttons have been chosen as 'the button' and rejected and as it stands right now the sweater might never be worn because I cannot settle on a button. Oh well. It was a fun knit. I spent entirely too much time placing, removing and replacing the current finalists. About twenty times. Every time I am firm in my decision, I take another look and change my mind. So, to distract myself from that I have been obsessing over my knitting. My current knitting (NaKniSweMo dontcha know), my future knitting, knitting I wish I could make work.... I am overwhelming myself with all of the knitting! I had better live a loooonnnnggg time. Experimenting with Apple Martini recipes. Listening to this and, while enjoying would be the wrong word for a book like this, I am finding it an interesting and compelling read. And Carole, between you and me, there may have been some lolling around. 2012. Fourteen. I would have done one of those survey thingies for the buttons, but since I have about sixteen readers at this point (neglect the blog and you know what happens....) it hardly seems worth it. Feel free to leave every opinion you have. About the buttons, that is. ONLY THE BUTTONS! During this particular week it is important to be clear on that. Know that I am sure to go with popular opinion do whatever I want anyway. If I can decide what it actually is that I want. It's NaKniSweMo and NoBloPoMo season! Swatching, casting on, posting to blog. Done. 2012. Ten. Cue hysterical laughter. 2011. Thirty-one. $5.00. So, while I am dragging on the daily posting it appears I am at a dead stop on the sweater knitting. Bummer. Swamplandia! is my current read/listen. I'm attempting to read/listen through the nominations for the Orange Prize for Fiction. Very few of them are available in audio format, so I may be actually reading some of them. I wish I could recommend the current selection and probably would if I was reading it, not listening to it. I admit to having high expectations when I listen to a book. The audio version of Swamplandia! is poorly narrated by one of the readers. It is unfortunate because while I am drawn in to the story, the young girl reading is distractingly bad. When I find myself repeating sentences and phrases in my head using more appropriate inflections or to pronounce words correctly I get irritated at the interrupted flow of the story. Why on earth would they hire a young teen to read a book? There are many talented adult narrators that sound young and have worked for young characters before. I will probably read this book on paper so I can get a better feel for the story which I am actually enjoying despite the issues of the audio version. 2011. Nine. $27.00. What are your current "yarns"? I can see my bloglines list growing from just the list of Yarn Alongers. I was going to blog about bloglines today, but I'll save that for another post. Posting has taken a back seat to Olympic finishing and frogging, but I got a lot done (sweater, tea cozy, felted bag, frogged sweater) and can claim medals. Tonight I am just too tired to post it all so you'll have to trust me and wait until Monday for the details. I didn't accomplish what some did, but I am psyched about what I did get finished and can't wait to share. Here's a sneak peak, no judging. I had been wearing the sweater all day before this photo was taken by a less than happily cooperative photographer after I drove home from Maine. Bob Costas: The hold up in Olympic knitting continues in the WIPs Dancing competition. Teresa C. of Knitting the Blues is suffering a type of mental paralysis over the Retro-Prep Cardigan. While it seemed she was just on the cusp of a completion, her momentary inablity to count has held her up. Caught in a lucid moment, she explains the decisions she has made and the ones still eluding her. Teresa C: Well. As reported earlier, I was on such a roll with this sweater. For me, the great thing about having a challenge like this is that it encourages me to take these projects that I have sitting around in various stages of completion and overcome whatever mind blocks that I had set up. I make decisions more quickly and stick with them. It is a pattern that is on the one hand exhilarating and on the other exhausting. Then there are those times when I am seemingly on a roll and I get a SMACK!down from the universe. Celebrating too early came back to bite me in the, ummm. Well, you know. While working on the next project I did make one decision. I will not be removing and re-knitting that button band. Which leaves me with other decisions to make. There are two other ideas that have been floating around in my head. First, I could use my sewing machine to add four more buttonholes and make it a nine Celtic Knot or a nine light blue/green button sweater. It might not look altogether normal when the sweater is unbuttoned, but I could work a buttonhole around the existing buttonholes. Or second, I could sew seven buttons to the buttonhole side of the sweater and snaps or hooks and eyes on the inside. I kind of love and hate that idea. Maybe more hate. Maybe. I don't really know who will be wearing this sweater, it certainly won't be me as the sleeves are too long and may not be the person I knit it for because her skin is so ultra-sensitive, I'm not sure I'm all that emotionally invested in getting perfect. Not as much as I am getting it finished. I KNOW IT!!!!! Who invaded this body and what have they done with ME? Bob Costas: Well, that's the latest from the Republic of Knitting the Blues. We'll be checking back in with her to see her overcome this obstacle. We'd love to hear your views on it. Go to Knitting the Blues and leave your thoughts in the comment section. We now return you to the curling competion where the Americans are making things rough for the team from Denmark. Hope this takes a while, I need to work on keeping this fire behind me burning. 2010. Thirty-one. I'd love it if these photos were a correct representation of the color of this sweater. You get the idea, though. I totally want to try curling. Pitching that stone is like dance, dontcha think? Matt Lauer: And good morning, we're at the venue for the WIPs Dancing Competition where the competition has been fierce. Meredith Vierra: Yes Matt, it is a marathon type event, some competitors have a longer way to go than others, but each has their own mental block to overcome in completing their individual performance. Matt: Oh, Al. Heh, heh. Meredith: Matt, we should explain what some of these athletes are up against. Take, for instance, Teresa C. from the Republic of Knitting the Blues. She entered this event with confidence, but with a project that she just had let sit to the point of creating a major mind block. Matt: Yes, Meredith, this sweater was started in 2004 and the majority of it had been completed for years. All it needed was to have the neckband knitted in, a steek marked and cut, the button bands added, the steek facings tacked down, a blocking and buttons sewn on. Let's take a quick look. Meredith: Teresa had a lot of momentum, showing great skill and perseverance. Knitting, steeking, and putting in bands like a mad woman. Al: And you think that's tough, she did it without the aid of liquid encouragement. Matt: (elbowing Al in the ribs) That's right Meredith. There is just no accounting for what happened next. She clearly had the number seven in her head. Even as she knit those buttonholes in, the number seven was in her head. As she pinned it out to block and went to purchase buttons, she knew it was seven. Seven, seven. Meredith: Yes Matt, this is what separates the real athletes from the also-rans. Right up to the point of pulling out the pins and removing the sweater from the blocking board she was celebrating her victory. But much like the snowboarder Lindsey Jacobellis, the celebration was premature. Al: Should have had that shot of vodka, T! Matt: It looked great until she realized that she had only put in five buttonholes. Meredith: And the steeks are all sewn in. Al: And the ends are all woven in. You could say there is not one piece of tail to be found. Heh. Al: Sh*t or get off the pot! HAHAHAHA! Matt: (hissing) Get him out of here. Meredith (laughing her *ss off). I'm sorry, I know. Okay (composing herself), it remains to be seen. Will those buttons go on? Will she un-sew the steeks, pull out the band and re-do it all? Matt: Or will Teresa's Olympic dreams be put on hold yet again. At 47, this could be her last Olympic games. Al: Should be yours, Matt! Maybe Teresa will knit a hat to cover that hairless dome you call a head for the next Olympics. AHAHAHAHAHA! Meredith: I think she will make the right choice and will have a medal around her neck. She is the hope of fans of Knitting the Blues, I don't think she'll let them down. Al: Whoa! Any tail in that video? HEH HEH! 2010. Thirty. Teresa declined interviews for this segment, but if you listen closely you can hear the hysterical laughter in the backround.